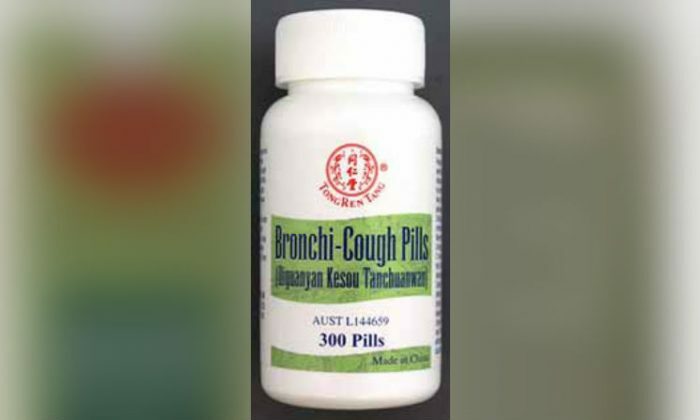 The Australian branch of a China-based herbal medicine company has issued an urgent recall for two batches of its herbal cough medicine after the Therapeutic Goods Administration (TGA) found contaminants linked to cancer in its product. Beijing Tong Ren Tang Australia said it is recalling batch 16080020 and batch 4080015 of its bronchi-cough pills (Qiguanyan Kesou Tanchuanwan) because traces of aristolochic acid and amygdalin were found in one batch, and amygdalin found in the other. Ingesting these substances even in small amounts can be harmful, according to the TGA. Readers in Australia who have any questions or concern are advised to contact the 1300 287 828. “Beijing Tong Ren Tang Australia Pty Ltd sincerely regrets any inconvenience to their customers,” the company said in its recall notice. Aristocholic acids were banned in Australia after several women at a clinic in Brussels, Belgium, in the early 1990s contracted nephritis and suffered rapid kidney failure as a result. They had to be hospitalised after they had taken a weight-loss formulation containing aristocholic acids. “There is no established safe exposure level to aristolochic acids, which have been linked to kidney problems and urinary tract cancers,” the TGA said in its recall notice. Amygdalin was once popularised as a cure for cancer but there has been no scientific evidence for such claims. On the contrary, it contains cyanide and can cause liver damage, nerve damage, and potential death. Amygdalin has been referred to as laetrile or vitamin B17 but the two layman terms are inaccurate—amygdalin and laetrile are different substances, and amygdalin is not a vitamin. A spokesman for Beijing Tong Ren Tang told The Australian newspaper that the company will be investigating the issue. “We haven’t come to a ­mutual agreement with TGA but those two substances have been found in the medicine … from our end, we’re going to carry on conducting a search into this,” he said. According to a report from Vision Times, the practice of traditional Chinese medicine (TCM) in its original form has dwindled in China over the past several decades. But many of the TCM understandings and approaches of human health have been adopted by the Japanese. Japan is currently the country with the leading number of doctors who use TCM in their clinical practice, according to the report. In another report featured on the World Health Organization website, a researcher explained in broken English how this departure in modernised TCM occurred. “The policy-makers and researchers in China are seemingly having their passions for integrating TCM and modern medicine into one, and the fact [sic] turn out to be that TCM cannot employ its values completely in national health system. “Those people educated and trained by scientific method and other so-called modern methods lack the ability of using correctly the non-medication therapies and medication therapies of TCM, and thus the clinical and preventive value of TCM in national health system is lessened by a regretful manner,” the report read. The report says there is “a serious flaw in the educational system of TCM including textbooks, curriculum, and faculty because many graduates from TCM academies couldn’t master the essentials of TCM,” and this has resulted in serious side effects and toxicity of Chinese medications. Chinese medicine is rooted in the belief that we are deeply connected to our environment. There are things that you can do to protect your health. Chinese officials have talked about the problem for years.